In stock -This product will ship today if ordered within the next 9 hours and 51 minutes. When your skin is a hot mess, this Hot Vegan Mask is your boot camp. This dreamy gel blend goes on light, contains Ayuvedic herbs, probiotics, and coconut water to help purify, energize, decongest, depuff and rebalance the health of stressed skin. Black pepper creates heat to loosen impurities, blackheads and blemishes while ginger stimulates. 100% vegan. Cruelty-free. Formulated without animal ingredients, petroleum, parabens and phthalates. For blemish prone skin. Aqua, Glycerin, Aloe Barbadensis Leaf Juice, Sclerotium Gum, Algin, Salix Nigra (Willow) Bark Extract, Zinger Officinate (Ginger) Root Extract, Elettaria Cardamomum (Cardamon) Extract, Piper Nigrum (Black Pepper) Fruit Extract, Cocos Nucifera (Coconut) Water, Lactoccus Ferment Lysate, Sorbitan, Oleate Decylglucoside Crosspolymer, Phenoxyethanol, Ethylhexylglycerin, Parfum (All Natural). Apply to entire face avoiding eye area and leave on 5-15 minutes. Rinse thoroughly. May be used as much as once a day. Follow with moisturiser. 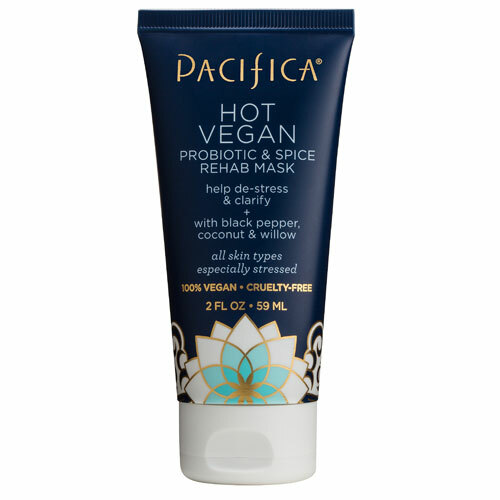 Below are reviews of Pacifica Hot Vegan Probiotic & Spice Rehab Mask - 59ml by bodykind customers. If you have tried this product we'd love to hear what you think so please leave a review. 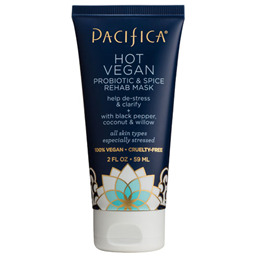 When your skin is a hot mess, this Hot Vegan Mask is your boot camp. This dreamy gel blend goes on light, contains Ayuvedic herbs, probiotics, and coconut water to help purify, energise, decongest, depuff and rebalance the health of stressed skin.